Best Supporting Actress, Comedy…Monica Abrahamsen "Social Security"
January 1999 - Humboldt Beacon - Christine Sackey - "Monica Abrahamsen and Bob Clark turn in strong performances as Trudy Heyman, Barbara’s uptight sister, and Martin Heyman, her equally uptight brother in law. …a nicely balanced cast who play off of each other well. The end result is a strong, even performance that is a delight to watch." January 1999 - North Coast Journal - Barry Blake - "The cast, with ensemble timing and generosity with each other, sets a sprightly pace. You suspect that Patrick Spike did not have to do too much intrusive directing with this bunch. 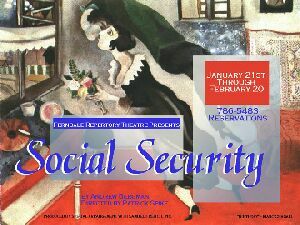 …" Social Security " is nifty easy and entertaining theatre at its best."